The Rolling Stones celebrated the release of their first single Come On by giving it a rare live performance to mark its 50th anniversary. The veteran stars slipped the track, a Chuck Berry cover, into their set for old times' sake as they played their latest show in Toronto last night. Exactly half a century ago today the band issued it as their debut single less than a month after recording it for Decca Records. The Stones rehearsed the track - which is thought to have been performed only eight times live - just hours before the show to refresh their memories. Frontman Sir Mick Jagger joked to fans in the audience: "I don't know if I can remember the lyrics." The quintet recorded the song at Olympic Sound Studios in Barnes, south west London, on May 10 1963, a day after finalising their record deal. 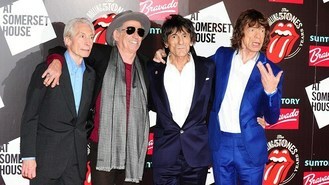 Prior to the show Sir Mick had recalled the excitement he felt when he heard the song on the radio for the first time. ''I was told by Decca that the record would be played that weekend by Brian Matthew on the big Saturday morning BBC show called Saturday Club, I was very doubtful if this was such a cert as Decca records had let us down so many times. "But come the day I was glued to the radio at 10 o'clock and there it was... First 45 played was ours - Come On." Manager Andrew Loog Oldham wanted to get something out as quickly as possible. Guitarist Keith Richards once said of the release: "At the time it was done just to get a record out. "We never wanted to hear it. The idea was Andrew's - to get a strong single so they'd let us make an album which back then was a privilege." The band are currently on the road with their 50 And Counting Tour in Canada and will headline Glastonbury Festival for the first time later this month, as well as playing two shows at London's Hyde Park in July. One Direction look set to boost their bank balances after signing individual publishing deals. Miley Cyrus has insisted she works extremely hard on her music, despite being a "party animal". Pharrell Williams has revealed that tracks on Justin Timberlake's debut album were originally meant for Michael Jackson. Union J are rumoured to be planning a man vs food style contest at this year's V Festival. Sir Elton John has spoken of his excitement at playing on a rock record for the first time - as his collaboration with Queens Of The Stone Age hurtles to the top of the charts. Sir Mick Jagger has recalled how he was "over the moon" to hear his first ever single on the radio - on the eve of the 50th anniversary of the track's release. X Factor winners Little Mix have become the first British girl group to debut in the US top five - beating even the Spice Girls. Prime Minister David Cameron mingled with chart stars such as Katie Melua and Chase And Status as he hailed the worldwide success of the UK music industry. Una Healy has denied speculation that babies could spell the end of the band.